Order lyophilized aliquots and avoid storing aliquots in solution. Your first 10 aliquots are free. Prevent breakdown of the peptides in stock solution caused by repeated freeze-thaw cycles. Many peptides are sensitive to freeze-thaw cycles. Small aliquots can be used once and discarded or stored for short periods at 4°C. Peptides are generally provided lyophilized as white fluffy powder, which has been proven to be the form most resistant to premature decomposition. Cysteine (C), methionine (M), rryptophan (W), asparagine (N), and glutamine (Q) are the most prone to degradation in solution. Instead of weighing out lyophilized peptide powder from a large container, measurements can be performed during the packaging process. LifeTein's aliquoting specialists have the acute focus and intensity required for precision aliquoting. Exposure to moisture will greatly decrease the long-term stability of lyophilized peptides. LifeTein's pooling and aliquoting protocols are validated. We guarantee the presence of all peptides, high-accuracy of aliquotation, and batch-to-batch reproducibility. 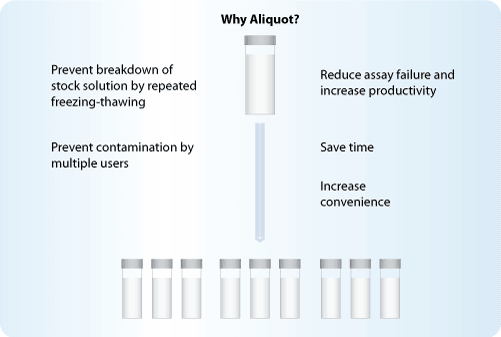 Reduce assay failure and increase productivity. Increase productivity by letting us take care of your aliquoting. In-house aliquoting may introduce multiple variables to the experimental process. You do not want to waste valuable time and resources troubleshooting a multi-step process. Let our dedicated staff provide you with a continuous supply of reliable, quantified aliquots to keep your project moving. Prevent contamination by multiple users. The more people who use a stock solution, the greater the chance of introducing a contaminant. It is much easier to manipulate a 1.5ml-tube than a 10ml-bottle!